This document covers the User Experience (UX) enhancements delivered with the CRM 2013 and CRM Online Fall ‘13 release of Microsoft Dynamics CRM. A limited set of these experiences were delivered with the Microsoft Dynamics CRM December 2012 Service update for the CRM Online customers and this fall 2013 release is a milestone in moving our customers to a new, delightful user experience. Throughout this document CRM 2013 is used to refer to both the on-premises and online versions of the product. The CRM engineering team has worked to develop a ground breaking CRM user experience that is easy to learn, effective for end users throughout their time in the product. It is our goal to create a product that is efficient and delightful to use. To do this we focused our efforts on three core pillars. We are creating an experience that is created to support the way people need to do their work, not just the things that they work with. By keeping everything the user needs in one window (unless asked for it) we lower the user’s cognitive load, making the app easier to use and the users more efficient. When the user opens a form, they often only need to read it, we’ve chosen to remove as much chrome and UI as possible to make that experience more enjoyable. But when the time comes to edit the data, everything is inline making it super easy to change what you need to when you need to. Although this document is focused on the CRM 2013 Web Client (surfaced via both a browser and Microsoft Outlook), the same principles were applied as we developed our CRM 2013 Mobile UX. While we are making significant investments in our User Interface, we have made a concerted effort to ensure that existing customers can upgrade easily and seamlessly, and obtain value from the new experiences on day one. The new User Interface is also much more intuitive than the CRM 2011 interface and we expect it will make our users significantly more productive. The sections below discuss the specific areas that have been improved for CRM 2013 and the upgrade experiences. The Microsoft CRM 2011 navigation experience relies heavily on launching new browser pages to complete a business process. 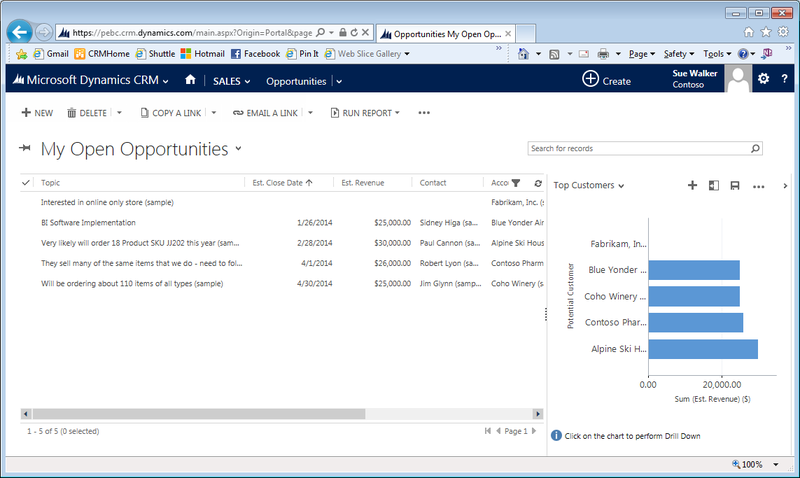 In CRM 2013, we have moved to a single window navigation model. Users can now work within the same browser page and keep their focus on the task at hand. We have provided navigation history to help the user navigate back to the previous pages. We have also added support for the browser Back button to allow for a more natural experience. The Microsoft CRM 2011 web application also consumes a lot of usable space on the screen by having an application navigation control on the page as shown below. With CRM 2013, we have moved this control to the top of the page. An example of this is below. Note: The navigation controls for the CRM Outlook client in CRM 2013 remain the same. Outlook has an existing navigation model which the CRM navigation hierarchy (sitemap) is represented in using Outlook folders, offering the most native and natural Outlook experience. 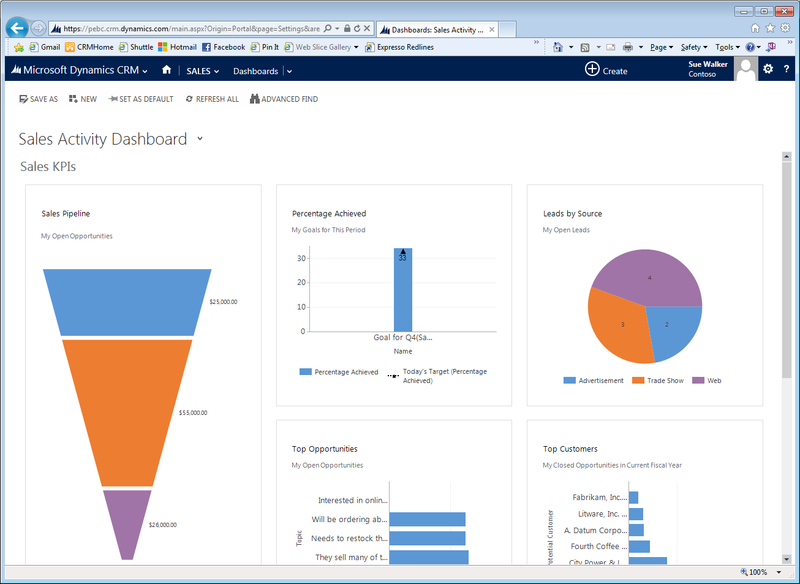 This navigation experience is automatically available when customers upgrade to CRM 2013. We use the existing customizations to the system and simply render them in this new User Interface. There is no development effort required to adopt this feature and any access controls set up with the CRM 2011 solution will continue to work. We have extended the CRM 2011 dashboard concept by associating these ‘workspaces’ to navigation areas for Sales and Service in CRM 2013. Customers can now specify the default dashboard associated with each area and role as well as the overall default dashboard. Dashboards have navigation model similar to the rest of the application and the desired experience is to keep the focus on the user on a single page. In CRM 2011 selecting a component on the dashboard results in a pop-up window displaying a detailed version of the component. In CRM 2013, we directly navigate to the detailed view and allow users to navigate back to the Dashboard via browser Back or the Navigation control. Some of the improvements to the CRM Record Forms were unveiled with the CRM Online December 2012 Service Update release – specifically for the Lead, Opportunity, Case and Account entities. The CRM 2013 release extends this to the majority of the UI – specifically most end user-facing entities and custom entities. From a developer’s perspective, we have maintained the Form definitions (in FormXML) from CRM 2011 and are simply rendering them in a new User Interface. It is important to note that Microsoft is releasing a new Forms Model with an optimized layout which customers can adopt, albeit with some customization work. A key change with CRM 2013 has been the way we render the Ribbon in the Web User Interface. An example of the CRM 2011 ribbon control is below. There are several reasons that we reduced the number of commands available at the top level of any entity. First, our research has shown that only 5-7 commands are ever used by most customers (customized solutions can extend this). The ribbon, exposing dozens of commands with limited utility caused a great deal of confusion and unnecessary complexity. To create the most effective solutions in the CRM industry, we applied a design concept referred to as ‘intentional constraint’. This allows us to focus our UI on the most important actions while maintaining the full featured complexity that you expect. We have also have removed common data entry tasks from the ribbon, and moved them inline to the place they are more commonly looked for. From a developer’s perspective, we have maintained the Ribbon definitions from CRM 2011 and are simply rendering them in a new User Interface. There is no action required from the customer to move to this experience. There is one exception here in that we have marked some OOB Ribbon commands as hidden based on low usage. If system customizers want to show these commands (especially if they have been customized), they can do so by updating the display rules. Note: The integration with the Microsoft Outlook Ribbon remains the same since the Ribbon commands are rendered in the Outlook Ribbon directly. The process bar is designed to guide an end user through a specific business process. In CRM Online December 2012 Service Update we supported this for the Sales and Customer Service process and had aligned these processes to the Lead and Opportunity, and Case entities respectively. In CRM 2013 we are extending this to the majority of entities in the system. From an upgrade perspective however, customers upgrading from CRM Online December 2012 Service Update will continue to have the same experience and customers upgrading to CRM 2013 will not have the Process Bar available on Record Forms until they create a Process for that entity or activate an out-of-box process included with the release. The CRM 2013 UI supports in-line editing of Form data and Auto-Save of changes similar to the experience in CRM Online December 2012 Service Update. Note that we have introduced a setting for customers wishing to turn off this capability across their organization. If customers are displaying the Activity Feeds or Yammer (if the customer opts in) for collaboration and the Notes control on a Form, we collapse them into a single control. An example of this control is below. There is no change in functionality of each component but the Activity Wall, Feeds (via Activity Feeds or Yammer) and the Notes control is collapsed into a single UI. Not that we only collapse these controls if they are visible on the 2011 form. If they are not, they will not be part of this control in CRM 2013 either. 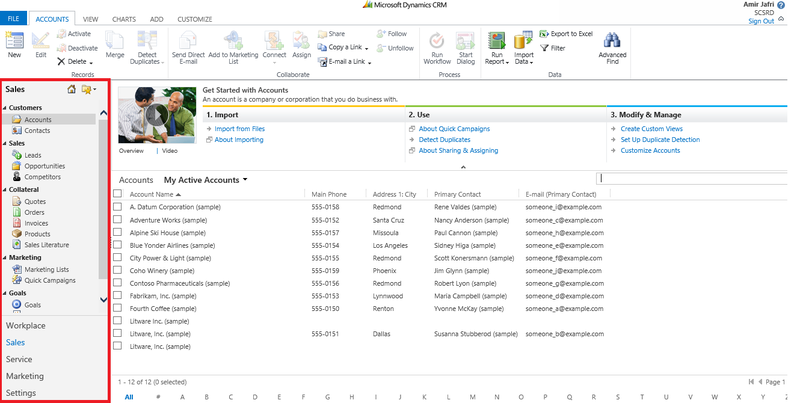 Subgrids included on Record Forms continue to behave functionally as they do in CRM 2011. We have reduced the number of contextual commands available when navigating to these ‘associated’ grids. We continue to support Add, Modify and Delete actions on the records in the grid via the Command Bar but have removed the other commands. Customers upgrading to CRM 2013 will not have to make any changes to their client-side scripts as long as they are using the CRM 2011 Client API. We are however deprecating support for the CRM 2007 endpoint and the CRM 4.0 API. Client-side scripting was not possible with the CRM Online December 2012 Service Update UI but that has been addressed with CRM 2013. All existing scripts continue to run like in CRM 2011.This also applies to any Ribbon extensions the customer has deployed. Note: As part of the simplification of the user experience, we are hiding some of the Ribbon commands in CRM 2013. If one of these commands has been customized, the customer will have to unhide it using display rules (as mentioned earlier).